When you hear of the Northern Lights, destinations like Alaska, Iceland and Norway spring to mind. But did you know Yellowknife in Canada is one of the world’s top destinations for seeing the Aurora Borealis? Located at 62.4422° N, 114.3975° W, Yellowknife is right under the auroral belt which covers most of the Northwest Territories in Canada. Blessed with clear skies, fewer mountains and crisp weather most of the year, tour operators in Yellowknife rightly boast that visitors are guaranteed a spectacular Northern Lights display if they stay for a minimum of 3 nights. 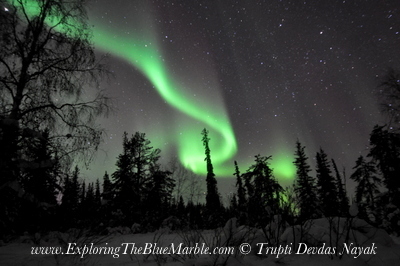 The Aurora Borealis activity peaks during the equinox months every year (March and September). If you are bold enough to brave the freezing temperatures (-30 deg celsius and below), December – April in winter is one of the best times to visit Yellowknife for the Northern Lights. Winter is also the best time to visit because of darker skies and longer nights. For those dreaming of viewing the Northern lights while staying cozy in just a t-shirt and shorts, it is definitely possible to see the lights in spring and fall, but be aware that your chances are much higher in winter. There are many hotels and B&B’s to choose from in Yellowknife and most people opt to stay in the city for the convenience of easy transportation and going with tours. 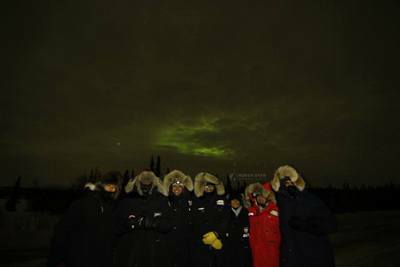 “Aurora Hunting” tours are popular in Yellowknife and many people opt for these nightly excursions at least once during their stay. I met people who had planned a tour with the same (sometimes different) operator for every night during their stay. Among the scores of tour companies, one highly recommended and popular tour operator in Yellowknife is North Star Adventures. After researching their tours and reading all the glowing reviews online on TripAdvisor, we decided to go with North Star Adventures for our Aurora Hunting experience. The staff at North Star Adventures were very responsive and helpful with all our queries about the tour. We were able to book everything online for our group for the date we wanted. Compared to some of the other tour operators, North Star Adventures promised an intimate small-group experience, guided personally by Joe, the founder of the company. Read more about Joe and North Star Adventures here. North Star Adventures offers convenient pick-up and drop-off from the hotel / B&B you’re staying at. Our adventure began at 9:30pm at night and promised to last till 3am or beyond, depending on the intensity of the auroral activity. 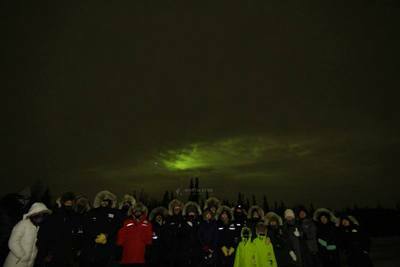 For the night of our tour, the weatherman had predicted cloudy skies but reasonably high auroral activity was expected. We were hoping against hope that we would get to see some lights. The weather is one thing you cannot plan for when traveling, and we’ve learnt to take it in our stride and make the best of what we get. We were glad that we were staying for 3+ nights in Yellowknife and would likely get more chances to view the Aurora Borealis in all its glory. As promised, Joe and his crew were right on time to pick us up at the hotel. We were in a van that could comfortably seat 8-12 people, with Joe driving us. Joe set expectations for the night right away by admitting that the weather forecast was cloudy, but he would do his best to get us as far away from the city lights as possible and perhaps there would be a break in the skies that would let us glimpse nature’s fireworks that we had come for. We appreciated his candor and optimism. Several people in our group were out for the 2nd or 3rd night in a row with Joe. They mentioned that they had enjoyed their previous experiences so much that they had taken the same tour with North Star Adventures every night for the rest of their stay in Yellowknife. The best way to view the Northern Lights is to go as far from the city lights as possible and Joe told us to get ready for a 45min – 1 hour drive to frozen lakes and snowy wilderness far away from the city center. It was a fun drive, and time sped by as Joe entertained us non-stop with remarkable facts and anecdotes, keeping us not only awake, but laughing and curious. Soon we were on a one-lane road, passing frozen lakes and snowbanks piled high. Joe pulled over and stopped. It was time to get out of the van and see if we could spot any Northern Lights. Once outside, everybody was busy craning their neck up, hoping to see the startling green of the aurora borealis. It was still cloudy and didn’t look like it was going to clear anytime soon. Joe walked around making sure everybody was warm and comfortable, patiently answering their questions and keeping up the energy with his booming voice and joie de vivre. After stretching our legs a bit, we all bundled back into the van and took off for the next stop. Further away from the city lights, perhaps there would be an opening in the gloomy skies and we might glimpse what we had come for. Joe soon pulled over at another frozen lake and we all got out wide eyed with anticipation. Far off in the distance, over a silhouetted treeline, some of us spotted something that was definitely green. 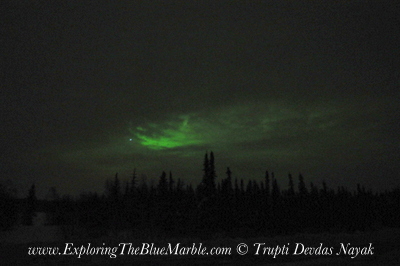 We squealed in delight as this was our first sighting of the Northern Lights and even though it was cloudy, we could see the intensity of the aurora backlighting the cloud cover. Joe quickly setup his tripod and camera and got everybody to stand still for a group photo. He was extremely professional when it came to taking superb photos of people underneath the Aurora Borealis. One look at the North Star Adventures Facebook page and you know he’s an expert. We all stood in groups as he setup the timer, flashed our faces with his flashlight to light up our smiles, and the camera captured the faint promise of Northern Lights in the background. Even though the aurora activity was predicted to be moderately high, the cloud cover prevented us from seeing it in all its glorious display. Everybody knew all along that there’s no way of controlling the weather, and we had to work with what we got. Joe made this trip immensely memorable with his high energy and optimistic attitude. He was a fountain of information as he talked about the Aurora Borealis and his childhood and youth growing up in Yellowknife. He gave us a glimpse of what life in Yellowknife was like, he talked about his family, his staff and the company he had founded – North Star Adventures – with fondness and great pride. Some of the people on our tour had already seen fabulous displays of the Aurora Borealis with Joe and North Star Adventures on previous nights when the skies had been clear. They were planning on coming back with Joe again tomorrow and the day after. As Joe said, the Aurora Borealis is never the same two nights in a row. It’s a very personal and magical experience to view the lights and irrespective of whether it’s a cloudy night or a clear starry night, one will never forget their first glimpse of the Northern Lights. We made a couple more stops to see if the skies had cleared up, but it was not to be. After a few hours of being out, Joe decided to turn back since we had to be back at the hotel by 3am. We were treated to cups of hot chocolate and home-made maple-sugar cookies that were a delicious ending to our night of hunting the Aurora Borealis. All the way on the drive back, Joe diligently kept glancing up at the skies to see if there was a break in the clouds. He kept us entertained the entire drive back by showing amazing photos of the Aurora Borealis taken by him. He recommended visiting Yellowknife at different times throughout the year, as the experience is unique to each season. He also showed us lovely photos of the Northern Lights being reflected in the lakes in summer and fall, and visitors standing spellbound looking up at the skies. Thank you North Star Adventures for a memorable night out hunting the Aurora Borealis! Joe made this a really fun adventure, thanks to his boundless energy and cheer. We were grateful and lucky that on subsequent nights, the weather cleared up and we were able to see the Aurora Borealis light up the entire sky in a most spectacular way. But the first time we ever saw the Northern Lights was with Joe the Aurora Hunter from North Star Adventures, and that is something we will always remember fondly! 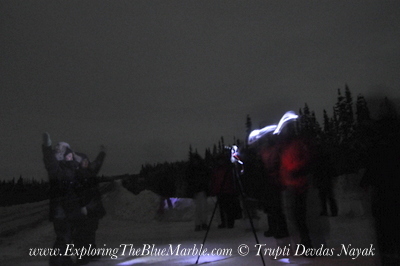 Disclosure: North Star Adventures provided for my Aurora Hunting Tour in exchange for writing about my experience. Regardless, everything I have said in this post reflects my honest observations and opinions. Trupti Devdas Nayak is a travel writer and photographer who is passionate about everything outdoors, whether it’s road trips, hiking, camping or just relaxing amidst nature. Trupti has trekked the Inca trail to Machu Picchu, hiked into the depths of the Amazon rainforest, backpacked the Havasupai trail in the Grand Canyon, trekked into the heart of Costa Rica's Corcovado National Park in Osa and explored 40+ National Parks around the world and counting. It is true what John Muir once said, “In every walk with nature one receives far more than he seeks,” so come join Trupti as she explores new trails, seeks higher mountains, and writes about her adventures at TrailBound. Trupti's writing and photos have been published in National Geographic Traveller India, Viator Things To Do, Viator Travel Blog, Snowshoe Magazine and Smarter Travel. Unless specifically mentioned, all images on this blog TrailBound are my own original photographs and therefore, copyright protected © Trupti Devdas Nayak. Please contact me if you want to use my images for commercial use. If you use my images for non-commercial use I ask that you provide me with the image credit. Likewise, if you pin my images to Pinterest, please mention me by name.